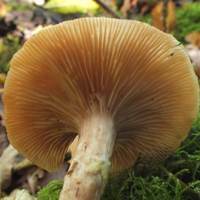 There are many forms of Honey Fungus, and in the past they all shared the scientific name Armillaria mellea. Nowadays it is generally accepted that there are several distinct species, one of which, Armillaria gallica, is distinguished by having a bulbous or swollen stem base. Armillaria gallica is on average a little smaller and usually darker than Armillaria mellea, and its pallid stem ring is insubstantial and usually not evident on fully mature specimens.. 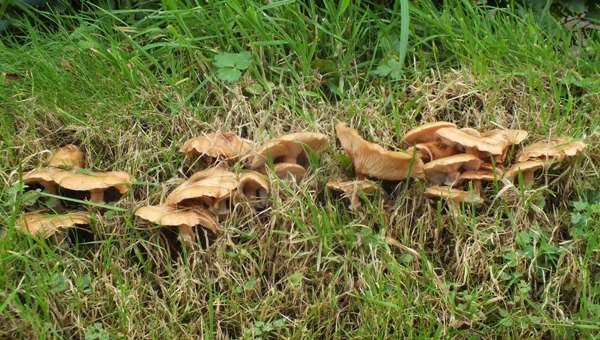 This species is an uncommon find in Britain and Ireland; it occurs also in most parts of central and southern mainland Europe and in North Africa as well as parts of Asia and North America (where it is often referred to as the Bulbous Honey Mushroom). 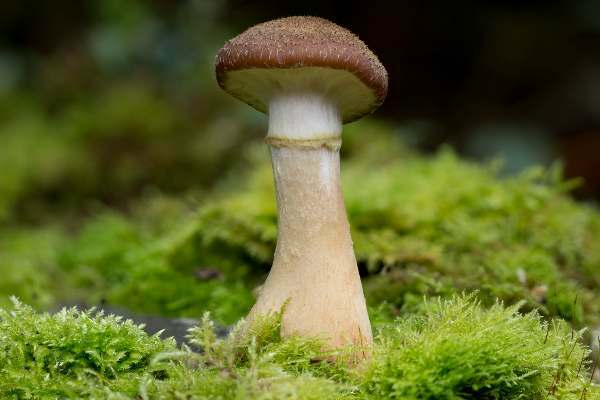 This species, formerly recorded in many field guides as a form of Armillaria mellea, was described in 1987 by Helga Marxmüller and Henri Romagnesi (1912 - 1999), who gave it the currently-accepted binomial scientific name Armillaria gallica. Synonyms of Armillaria gallica include Armillaria bulbosa (Barla) Kile & Watling, Armillaria inflata Velen., Armillariella bulbosa (Barla) Romagn., and Armillaria lutea Gillet. The specific epithet gallica comes from the Latin noun Gallia which means that it is French; France is indeed the geographical location (known as the type locality) where the type specimen of Armillaria gallica came from. Although all Armillaria species were for many years generally considered edible when thoroughly cooked, members of the honey fungus group (including Armillaria mellea, the type species of this genus) that occur on hardwoods are considered by some to be suspect, as cases of poisoning have been linked to eating these fungi; this is most probably due to a small but significant proportion of people being adversely affected rather than a universal human reaction to these fungi. We therefore recommend that Armillaria gallica is not collected for the pot. 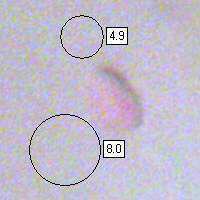 4 to 10cm in diameter; colour ranging from ochre-brown to red-brown, usually somewhat darker near the centre. The cap flesh is white and firm. Initially convex with inrolled margins, the caps flatten and become slightly depressed with slightly wavy margins. Fine brown scales with darker tips cover the cap surfaces. The adnate or weakly decurrent gills are crowded and initially almost white, gradually becoming yellowish-brown at maturity. 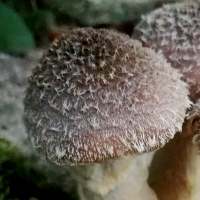 White at the apex; colour as cap below the ring zone, darkening as the fruitbody matures; 5 to 10mm in diameter and 5 to 12cm tall; bulbous towards the base where stems usually emerge from the substrate in clusters. 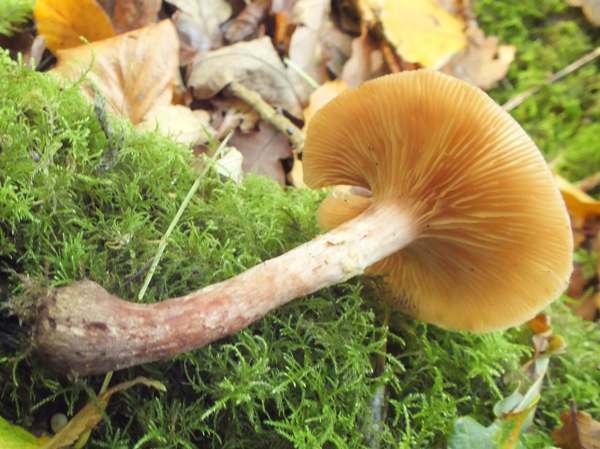 The stem flesh is whitish, and there is a short-lived cobweb-like ring (reminiscent of the cortina characteristic of the genus Cortinarius) that collapses to leave a yellowish ring zone on the stem. 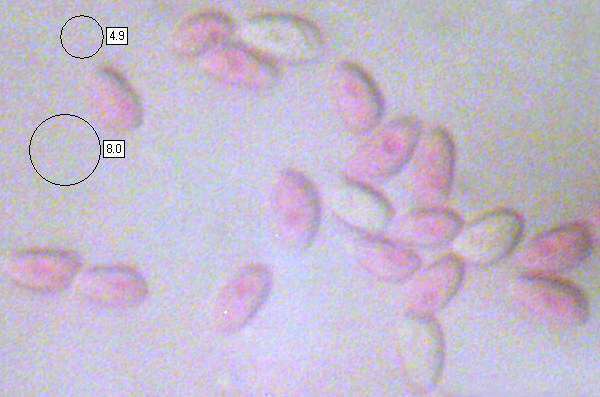 Ellipsoidal, smooth, 7-8.5 x 5-6µm; amyloid. Sweet odour but sometimes with a bitter taste. Saprobic on woodland litter, dead stumps and buried rotting wood of broad-leaf trees; very occasionally found under conifers. 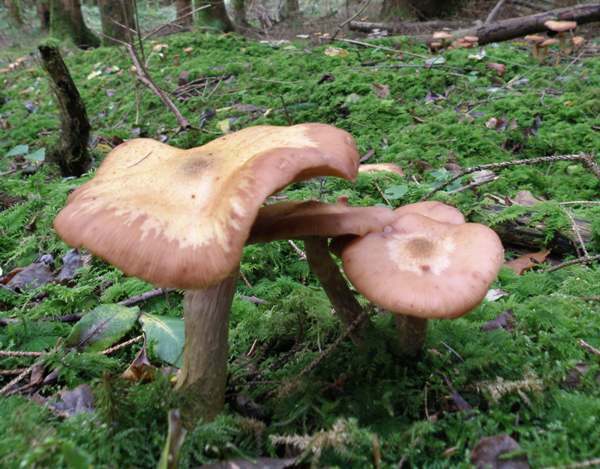 Armillaria mellea, commonly referred to as Honey Fungus, is larger and paler but it has a persistent stem ring.